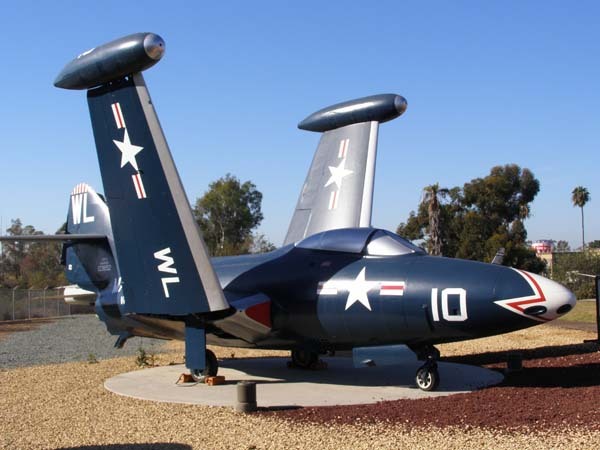 F9F-2 Panther BuNo 123652 was delivered to the US Navy on October 20,1950. It was first assigned to Fighter Squadron 721 (VF-721) aboard the aircraft carrier USS Boxer where it saw service in the skies over Korea. It later served with VF-821, VF-51 and Naval Training Units at Naval Air Stations Glenview, Kingsville, Memphis, Corpus Christi, Sherman Field and Jacksonville. It was retired in 1956 with 1,575 airframe hours. 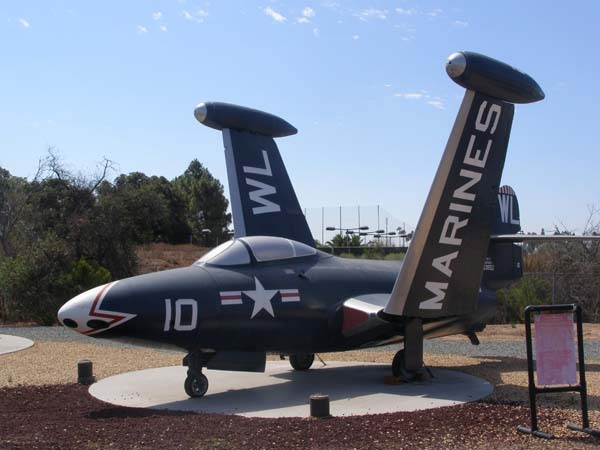 It is painted as a VMF-311 aircraft flown by Captain W.A. Bloomer, who years later as Brigadier General Bloomer, Commander Air Bases West, was instrumental in helping establish the Flying Leatherneck Aviation Museum. This aircraft is on loan from the National Museum of the Marine Corps. Single seat, single engined, carrier-based day jet fighter. Korean Yak-9 fighter on July 3,1950 by LT(JG) Leonard Plog of Fighter Squadron 51 (VF-51). the 1960s. Total F9F production was 1,382 aircraft. of UN forces fighting in Korea on 3 July 1950.
powers the F9F. The Nene engine was also the basis for the MiG-15’s Klimov VK-1 turbojet. The Panther was the primary Marine Corps jet fighter and ground attack aircraft in the Korean War. flew the F9F as Marine Corps pilots with VMF-311 in Korea. Length: 37 ft., 5 3/8 in. Height: 11 ft. 4 in.